Floyd Crim & Sons is a 4th generation, family owned and operated, business with over 50 years of experience of serving central and east Indiana. Crim and Sons Paving is located in the small town of Manilla, which is in Shelby County, about 25 minutes southeast of Indianapolis. Founded in 1950 by Floyd Crim and his sons, Robert & Jim, the company started mostly as a trucking business hauling stone and gravel. In 1961, the company expanded its services to include asphalt paving. In 1977 the founder's grandsons, Steve & Tim, joined the company as full time partners and are currently still with the company. Steve's sons, Kevin and Brian, have also recently become partners within the company over the past few years. In 1982, Crim & Sons made a major commitment and built their own asphalt mixing plant and in 1994 the plant was upgraded to a state of the art asphalt mixing facility that more than doubled the plant's 50 tons per hour capacity to 110 tons per hour. Having our own mixing plant is important to us because we want to know and be responsible for the quality of asphalt that you're receiving and making an investment on. At Crim & Sons Paving, we are responsible for everything that is associated with your paving project, from the excavation to the finished product. The managers of Floyd Crim & Sons strive for quality in all aspects of the jobs they perform. From grading the surface to compacting the base to the final top coat, be assured that the best methods and materials are being used. 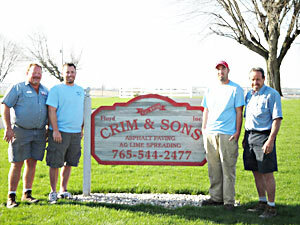 Being family owned & operated enables Crim & Sons to offer personal attention to each customer. The same person who gives you an estimate will also be there while your site is being paved.